Hey coaches, start showing some guts! Buck-buck-brawckkkkkkk! It's only the first week of the season and already NFL coaches are playing a mincing fraidy-cat football, seemingly more concerned about avoiding criticism than going all-out to win games. Maybe you can understand a coach losing heart in December -- but it's only the first week of the season! Buck-buck-brawckkkkkkk! • Trailing 13-0 in the first half, the Redskins faced fourth-and-1 at midfield against the Giants. You're down by two scores against the defending champions, you cannot seriously be punting from midfield! Boom goes the punt. Now trailing 16-7 with 10 minutes remaining, the Skins faced fourth-and-6 on their own 26. They still need two scores, and now the clock is fading. Punt and you might as well leave to get blueberry-almond martinis. Rookie head coach Jim "Dan Snyder Hasn't Fired Me Quite Just Yet" Zorn sends in the punt unit, and TMQ wrote the words "game over" in his notebook. • Facing the other Super Bowl team, New England, Kansas City punted on fourth-and-1 on consecutive possessions. The Chiefs lost by seven points. • After failing on fourth-and-1 early, Houston kicked a field goal when trailing 21-0, then punted from midfield on fourth-and-7 when trailing 35-3. • Trailing Philadelphia 38-0, St. Louis kicked a field goal. • Trailing Baltimore 10-3 in the third quarter, Cincinnati punted on fourth-and-1 in Baltimore territory. On their final possession, the Bengals tried and failed on fourth-and-1 in Baltimore territory, but by then a sense of desperation had set in. • Trailing Dallas by 28-7 in the fourth quarter, Cleveland kicked a field goal on fourth-and-3 from the Cowboys' 17. If it were a chess match, the notation would read: "!!!!!!!!!!" Not only is fourth-and-3 attractive as fourth-down chances go -- before the kick Cleveland needed three scores, and after the kick Cleveland needed three scores. • Trailing Atlanta 21-0, Detroit punted on fourth-and-7, from the Atlanta 40. • And of course I have a counter-example. Leading San Francisco 13-10, Arizona faced fourth-and-1 on the Niners' 2-yard line. The Cardinals went for it, scored a touchdown and never looked back. What's with all the fraidy-cat punting? Since the typical NFL play gains about 5 yards, the odds favor conversion attempts, even if some such attempts fail: Last year I reviewed the math in detail. But many coaches are not motivated by gaining yards, they are motivated by trying to avoid criticism. Case in point: Monday morning, Houston coach Gary Kubiak was getting hammered with criticism for going for it on the opening drive: though his decision made eminent sense, it just did not work out. Because Kubiak ordered the try, he's to blame. Had he ordered a punt and the final score been the same, pundits would have held the players to blame. Such blame-shifting, TMQ has become convinced, is the No. 1 reason NFL coaches order punts on fourth-and-short, even when trailing or inside opposition real estate. Otherwise, coaches too often play to restrain the margin of defeat, rather than go all-out to attempt to win, which may increase the margin of defeat. Trailing 16-7 in the fourth quarter, Zorn was essentially running up the white flag by ordering a punt. By that point, tactically he was playing for a close loss to the defending champions, which would look better on his résumé than a big defeat. Coaches in his situation may think, "If we punt, I surrender all chance of victory, but retain a decent chance of having the game end as a close defeat. If we go for it, I keep alive a small hope of victory, but risk a bigger defeat." Coaches then decide to do what is best for them personally in career terms, rather than risk everything for a win. Are the Patriots done with backup quarterback Matt Cassel suddenly thrust into the starting role? Roger Staubach, 1971 Cowboys: Craig Morton began the year as the starter, but Staubach (who had started four games his first two seasons) soon took over and eventually led the team to 10 straight victories. Jim Plunkett, 1980 Raiders: Plunked hadn't started a game since 1977 when he replaced Dan Pastorini, who had broken his leg. He threw five interceptions in his first game, but eventually became the Super Bowl MVP. Plunkett, 1983 Raiders: Plunkett replaced an injured Marc Wilson early in the season and again led the Raiders to the Super Bowl title. Doug Williams, 1987 Redskins: Williams hadn't started an NFL game since 1982 and only started two regular-season games in '87 (the Redskins lost both), but replaced Jay Schroeder for the playoffs. Jeff Hostetler, 1990 Giants: He had started just twice in four seasons when Phil Simms went down with two games left. He went 5-0 as starter, including a 20-for-32 effort in the Super Bowl. Kurt Warner, 1999 Rams: He had thrown 11 career passes when he replaced an injured Trent Green in the preseason. Threw for 41 TDs, was named season MVP and Super Bowl MVP. Trent Dilfer, 2000 Ravens: After flaming out in Tampa, replaced Tony Banks and went 7-1 in the regular season and 4-0 in the playoffs. Tom Brady, 2001 Patriots: Like Cassel, Brady was untested when he replaced injured Pro Bowler Drew Bledsoe in Week 2, having thrown just three career passes. That ridiculous St. Louis field-goal attempt when down 38-0? Sure, Les Mouflons were beaten at that point no matter what Scott Linehan decided. But professional dignity requires going for it rather than kicking a meaningless figgie. Instead Linehan ordered a kick, mayhap wanting to insure that when his year-end performance review is held, one of the knocks against him will not be, "We got shut out at Philadelphia." That ridiculous Cleveland field goal on fourth-and-short when down 28-7 to Dallas? Browns coach Romeo Crennel knew that if his team failed to score double digits, the game would be viewed as a disaster. Advancing the score to 28-10 might deflect some criticism, even if the kick nearly zeroed out any chance of a Cleveland comeback. The Browns didn't even try an onside kickoff following the field goal! With 10 minutes to play and trailing by three scores, Crennel ordered the kickoff boomed deep. Cleveland never took possession again, as a Boys clock-killer drive that included a sequence of eight consecutive rushing plays brought the game to all-naughts. Why didn't Crennel at least order an onside kick? Because he was playing to restrain the margin of defeat, rather than going all-out to try to win. And it's only the first week of the season! In other football news, quarterback Matt Cassel of the Patriots is about to make his first start in nine years. Other than one start at USC at tight end, Cassel hasn't trotted out during player introductions since his final high school contest, in 1999. 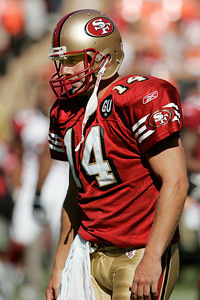 He never started a game in college, backing up Carson Palmer and Matt Leinart. New England has long played with fire by having no premium young backup quarterback behind Tom Brady. But if anybody can do a good job after not starting in nine years, it will be a quarterback from the New England coaching system. (Or Todd Collins, who last season played well for Washington after not starting in 10 years.) The Flying Elvii were pinned against their goal line when Cassel entered the game Sunday. He retreated into his end zone and confidently lobbed a 51-yard completion to Randy "Two Face" Moss, the kind of call -- deep pass from the end zone -- coaches generally entrust only to skilled veterans. As for any predictions New England will collapse without Brady, bear in mind: Currently the Patriots are on a 24-2 run, with their only losses being defeats decided late by that year's Super Bowl champion: the Colts and then the Giants. Even with Brady holding a clipboard all season the Patriots remain a monster team. In end-of-the-universe news, reader Jared Adkins of Silver Spring, Md., reports the European organization about to turn on a super-advanced atom smasher -- see last week's TMQ -- says that if the device inadvertently creates a black hole on Earth, the black hole will "rapidly evaporate." Why do I not find this reassuring? How much of Switzerland will the black hole take along as it evaporates? Stat of the Week No. 1: Brett Favre and Peyton Manning have combined for 414 consecutive starts. Stat of the Week No. 2: Teams from Pennsylvania won their games by a combined 76-20. Stat of the Week No. 3: Indianapolis and San Diego, AFC favorites of many touts, are on a combined 0-5 streak going back to last season. Stat of the Week No. 4: Stretching back to last season, Kansas City has lost 10 consecutive games. Stat of the Week No. 5: Atlanta scored more points (21) in the first quarter against Detroit than in 13 of its 16 games of 2007. Stat of the Week No. 6: Despite throwing for just 125 net yards in a 16-7 defeat to defending champion Jersey/A, Washington quarterback Jason Campbell posted a significantly better passer rating than Eli Manning -- 81.2 to 61.1. Stat of the Week No. 7: Against St. Louis, Philadelphia passed for 414 yards -- with both starting wide receivers out hurt. Stat of the Week No. 8: Buffalo punter Brian Moorman now has a touchdown pass as well as five career rushes for first downs from kick formation. Stat of the Week No. 9: The Vikings, picked by many to reach the Super Bowl, have lost three straight games, dating back to last season. Stat of the Week No. 10: The Dolphins are 7-26 since the moment Sports Illustrated predicted they would win the Super Bowl. Cheerleader of the Week: Marlina of the San Diego Chargers, a veteran of the Sports Illustrated NFL cheerleaders bikini shoot. According to her team bio, Marlina runs a cleaning company that "specializes in non-toxic, natural and eco-friendly cleaning methods using only biodegradable products." From the looks of her team portrait, she also owns a wind machine! Sweet Play of the Week No. 1: The trap block has gone out of style, perhaps because supersized modern offensive linemen have trouble executing a super-quick pull. Trailing Indianapolis 3-0, the Bears faced third-and-6 at midfield. The Lucky Charms backed off, expecting pass. Bears coaches called a trap run up the middle, with second-year left guard Josh Beekman pasting a Colt at the point of attack. Matt Forte ran untouched 50 yards for the score. It's pretty fun to run 50 yards on national television when everyone in front of you has already been knocked to the ground. Sweet Play of the Week No. 2: Baltimore ran a flip reverse on which Derrick Mason did a full-speed no-look flip to Michael Clayton, who went 42 yards for the touchdown. (Announcers of course called the play a "double reverse"; the ball only changed direction once.) Ravens coaches might be hesitant to radio in this play again, though. Clayton took the reverse 13 yards behind the line of scrimmage; the play could have backfired in a major way. Sweet Play of the Week No. 3: Trailing Green Bay 17-6 at the start of the fourth quarter, Minnesota faced a fourth-and-1 on the Packers' 23-yard line. Rather than launching a kick to pull within eight points, the Vikings did the manly-man thing and went for it. Power dive with Adrian Peterson? No, play-fake to Peterson and four receivers in the pattern. The tight end on the left ran a short cross, the left wide receiver ran a post, the right slot man ran a short cross and the right wide receiver, Sidney Rice, ran a deep cross to the left corner, touchdown. The play was not designed to gain a yard -- rather, it was designed to score a touchdown, and that was sweet. And the pass routes were so well designed that I am adding this play to my middle-schoolers' playbook. Rice was crossing left as three other guys crossed right, one deep and two shallow. The Green Bay secondary completely lost track of Rice, and that's a sweet play. In Philadelphia, there is a consistent relationship between cheer professionalism and victory. Sour Play of the Week No. 1: Philadelphia led St. Louis 14-0 with a minute remaining in the first half, and faced third-and-8 on its own 10. Les Mouflons can surrender turf without worry: The only thing that can go wrong with a minute remaining and 90 yards to the goal line is for someone to get behind the secondary. Hank Baskett -- the Hank Baskett -- gets behind the secondary, no safety anywhere in sight. Ninety-yard touchdown and the rout is on. Sour Play of the Week No. 2: Ravens rookie quarterback Joe Flacco seemed to be moving in slo-mo as he took a naked bootleg 38 yards for a touchdown. But talk about slo-mo -- several Cincinnati defenders made no attempt to chase Flacco, and others who did were jogging, not sprinting. Sweet Defensive Play of the Week: Pittsburgh leading 21-0, Houston reached first-and-10 on the Steelers' 12. The Steelers' defense dropped Moo Cow runners for losses on first and second down; when the fraidy-cat field goal boomed, the game for intents and purposes was over. Sweet Special Teams Play of the Week: Leading Seattle 20-10 late in the third quarter, Buffalo's field goal unit broke from the huddle. Defensive end Ryan Denney, normally a kick-unit extra blocker, reported eligible and split wide left. No one from the Seahawks lined up across from him. Holder Brian Moorman quick-snapped and pitched a touchdown pass. Shook up, the Blue Man Group fumbled the ensuing kickoff, and the Buffalo Budgies (note: new cognomen based on upcoming Toronto game) scored on the next snap to ice the game. On the day, two touchdowns and a takeaway by the Buffalo special teams -- none too shabby. The Budgies further shook up the Seahawks by occasionally using an all-standing front, which Buffalo coaches call the Sugar, but which was dubbed the Radar Defense by my high school football coach, who devised it. The Radar Defense was a fad in the early 1970s, then forgotten. Here's hoping for a comeback. 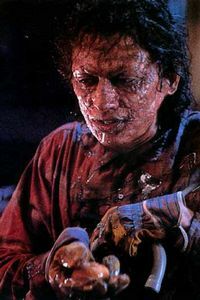 In "The Fly," a horrible genetic experiment gone awry causes Jeff Goldblum's DNA to merge with rubber masks, pancake makeup and spray-painted foam. FAT LADY IN BREASTPLATE: Hot! I am hot. I am so hot! (Cadenza.) My mean global temperature has risen 1 degree Fahrenheit! SCIENTIST (delivered rapidly, parlando): Atmospheric concentration 380 parts per million. Petroleum use 80 million barrels daily. Sequestration options limited. Polar sea ice melting. Cue Prima Donna -- Al Gore Enters, Orchestra Swells, Recitativo Accompagnato. GORE: I am the sole hope of humanity -- how fortunate I am humble. 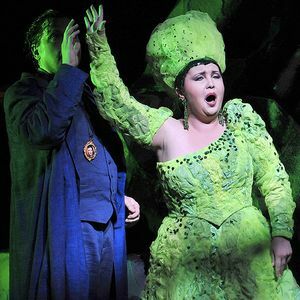 In this scene from the Al Gore opera, she sings of watts per square meter and hydrogen ratios. Valkyries Descend, Heavens Open, Sea Level Rises. Sweet 'N' Sour Play: New Orleans trailing City of Tampa 17-13 at the end of the third quarter, the Saints had first-and-10 on their 16. Seeing the Bucs' safeties crowd the box expecting a run, Drew Brees audibled to a "go" to Devery Henderson, who took the pass 84 yards for a touchdown. That was sweet. But Henderson ran the final 20 yards waving the ball in the air, and it wasn't his athletic genius that caused the Tampa cornerback to fall down. Waving the ball invites the vengeance of the football gods; Henderson's sportsmanship was sour. He would be one of the world's 100 most influential people -- um, if he existed. Newsmag Editors Please Note, Actors In Superhero Costumes Cannot Actually Fly: TMQ liked "Iron Man," which was a well-done movie with a nice sense of humor until a formulaic final reel. In action flicks or sci-fi, I will accept the premise, but events must be compatible with physical law. I am willing to stipulate that an amazing "arc reactor" allows a man swathed in metal to fly, but the physics of his flight still should make sense. 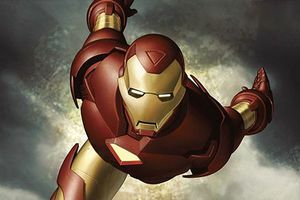 When Iron Man was caught between two F-22 interceptors, he escaped by opening flaps on his titanium suit; the flaps caused him to slow dramatically, and the fighters roared past. But Iron Man slowed from supersonic flight to a stationary hover in a couple of seconds. Iron Man himself has no special powers, he's just a guy with a cool suit. G-force loading from the maneuver would have torn his body apart. Actor Robert Downey Jr., who starred in the movie, was named to the most recent "Time 100," purporting to present the world's 100 most influential people. Note to Time editors -- Downey cannot actually fly or fire repulsor beams at terrorists. That was a movie! Hollywood types are paid huge amounts of money, and like to imagine the money is proof of their importance; newsmags go along with this pretense in order to win access to celebrities. I would argue that no one from the entertainment realm who was listed among the globe's 100 most influential people by Time -- Downey, Miley Cyrus, Mariah Carey, the Coen brothers -- has any influence on world events. What has any entertainment figure in the 2008 Time 100 actually accomplished, other than personal self-promotion? That's OK, their hearing has taken such a beating, Black Sabbath members can no longer understand their own lyrics anyway. Soundtrack note: The Black Sabbath song "Iron Man" played over the ending credits of the flick. Lyrics were electronically scrambled so they couldn't be understood. Original lyrics from the song, which is about an amok robot that destroys the world, include the cheerful, "Now he has his revenge/heavy boots full of lead/fill his victims full of dread." At the ESPYS in Los Angeles, the same song played over intros of the Best Male Athlete finalists. Listeners could clearly understand the innocuous "Now the time is here ..." line, but the next three lines were electronically garbled so as to be inaudible. The missing lyrics: "... for Iron Man to spread fear/vengeance from the grave/kills the people he once saved." Line Play Report: Ninety percent of the action in football happens away from the ball. Line play often decides games, though many viewers may not know that because television cameras follow the ball. This weekend both Philadelphia lines dominated both St. Louis lines; backup players on the Nesharim offense were able to roll up 522 total yards because their line play was so good. During its hectic final drive, Carolina's offensive line dominated San Diego's defensive line, with no defender getting close to quarterback Jake Delhomme as he completed 8 of 11 passes -- and the Bolts' front seven knew Delhomme would be passing. On the negative side, the Jacksonville offensive line allowed seven sacks while Jax ran for just 33 yards. Sure, injuries were a problem, but every team has injuries. And the normally efficient Indianapolis offensive line looked awful. Right tackle Ryan Diem barely slowed Chicago rookie defensive lineman Marcus Harrison as he blew through to sack Peyton Manning at the Colts' 2-yard line. On the next snap, Diem turned inside to double-team a defensive tackle, totally ignoring the man in front of him -- defensive end Adewale Ogunleye -- who blew through untouched for the safety that changed the game's momentum. They have too much horsepower, and we're all to blame.
" Don't make the mistake of thinking for one minute that America's petroleum addiction is even close to fixed. For cars, SUVs and light trucks, there are two forces at play in oil-addiction trends, but only one is generally recognized. 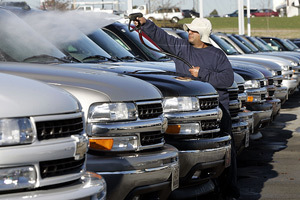 Everybody knows the fad of big vehicles increases petroleum needs -- according to the EPA, the average weight of passenger vehicles has risen 30 percent since 1988, while average MPG is down. The other factor, little acknowledged, is horsepower, which has risen even more sharply than weight. Twenty years ago, the average new passenger vehicle sold in the United States had 120 horsepower. For this model year the figure is 230, almost double. There will be no fundamental change in oil import levels until horsepower numbers change. Like weight, horsepower depresses fuel economy. Simply knocking a third off the horsepower of new U.S. passenger vehicles would, in about a decade -- as efficient new vehicles replace wasteful old ones -- eliminate approximately the amount of oil the United States imports from the Middle East. Yes, it's that simple. Race cars need lots of horsepower; suburban family cars do not. Excessive horsepower causes the United States to be dependent on Middle East dictatorships, engages military commitments to those dictatorships, drives up the price of oil and pushes down the value of the dollar. Horsepower is also the enabler of road rage -- rapid acceleration allows cutting off, drag racing and sudden lane changes. Road rage entered national consciousness as a problem in the mid-1990s, exactly when the horsepower ratings of new vehicles began to spike. Yet nearly all auto companies selling in the United States continue to introduce overpowered cars that require far too much fuel. The problem transcends brands, whether domestic or international. The new BMW 550i sedan has 360 horsepower and records just 18 MPG. Pontiac's new 361-horsepower G8 GT is a small car that gets just 18 MPG. Only in America do small cars waste gasoline. Ford's new Taurus sedan has a 263-horsepower engine which delivers only 22 MPG in its front-wheel-drive variant, an awful 19 MPG in the all-wheel-drive version. The Taurus isn't a sports car, it's a family car! Toyota's new Camry, another family car, offers 263 horsepower and just 22 MPG. The Dodge Avenger, a family car, when ordered with the optional 255-horsepower engine posts just 18 MPG. Infiniti's 320-horsepower FX45, Cadillac's 403-horsepower Escalade and the 500-horsepower Porsche Cayenne Turbo achieve a dreadful 14 MPG. (All mileage figures in this column are the "combined" numbers that blend city and highway driving. Under real-world circumstances, especially stop-and-go commuting, many drivers average well below the official number.) Plus, the more horses, the more greenhouse gases. According to the EPA, a Porsche Cayenne Turbo emits 13.1 tons of greenhouse gases annually. Check any car's MPG and greenhouse numbers here. 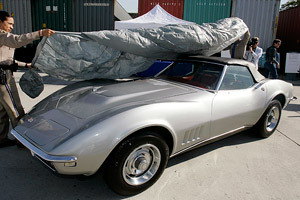 A 1968 Corvette -- which had less muscle than a typical 2008 family car. Less horsepower would mean better fuel efficiency, diminished petroleum imports and lower carbon emissions but, inevitably, reduced acceleration. Don't buyers crave speed? Most cars are already too fast! Thirty years ago, the average passenger vehicle did zero to 60 MPH in 14 seconds; for 2008, the average is about 8.5 seconds. That new 263-horsepower Ford Taurus family sedan does zero to 60 in 6.5 seconds -- the same acceleration as the 1968 Corvette with the famed 427 big-block V8. The new Camry and Honda's comparable new Accord do zero to 60 in about 7 seconds. Acceleration of this type is not needed for everyday driving; such power is useful mainly for speeding, running lights and cutting others off. Lexus has aired ads boasting that its new IS-F model, with a 416-horsepower engine, does zero to 60 in 4.6 seconds; the new 480-horsepower Nissan GTR is even faster at 3.8 seconds. Both have dismal mileage ratings. Lexus is telling the business media the IS-F is intended for the United States and won't be pushed in the company's home market of Japan. There, the IS-F's road-rage engineering and 10.2 tons of greenhouse gases released annually might be controversial. In addition to reducing fossil-fuel use, dialing down horsepower would reduce highway deaths. Researcher Michael Sivak of the University of Michigan's Transportation Research Institute has found that highway fatalities dropped sharply earlier this year as gas prices shot up, with highway deaths declining 22 percent in March and 18 percent in April. (Note: You can reach the Transportation Research Institute only by car.) This spectacular decline in deaths, receiving little public notice, came about, Sivak found, mainly when drivers slowed down in order to improve MPG. High-horsepower vehicles encourage speeding, because they make soaring above the speed limit feel effortless. If horsepower were reduced by sensible amounts, there would be less driving 80 MPH in 60 MPH zones, or 50 MPH in 30 MPH zones. Sivak's numbers suggest that if America became sensible about speed, perhaps 8,000 lives per year could be saved. Eight thousand lives per year would represent more Americans saved than if all incidents of drowning were eliminated. Federal legislation to regulate the horsepower of passenger vehicles, perhaps by establishing a power-to-weight standard, would reduce petroleum consumption, cut greenhouse gas emissions, lower U.S. oil imports, strengthen the dollar, and take some of the road-rage stress out of driving. So what are we waiting for? Whatever your answer, don't reply, "No one can tell me what I can drive." Courts consistently rule that vehicles using public roads may be regulated for public purposes, such as safety and energy efficiency. NASCAR races occur on private property -- there, horsepower is nobody's business. On public roads, horsepower is very much everybody's business. You'd be laughed at if you asserted a "right" to drive a locomotive down the freeway. Where is it written we have the "right" to operate an overpowered car that wastes oil and pollutes the sky? 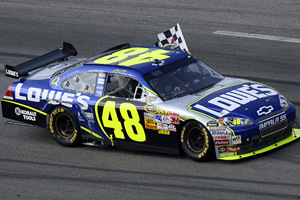 NASCAR cars need high horsepower, cars bound for suburban shopping malls do not. Meanwhile, all the talk lately has been about getting drivers into hypothesized future vehicles that might get excellent mileage, such as plug-in hybrids. Even assuming such cars someday are in showrooms, the payoff is greater for getting people out of low-mileage vehicles right now, because low-mileage vehicles are disproportionate consumers of fuel. Assume an average year of 12,000 miles traveled. The driver who trades in a 15 MPG SUV or high-horsepower car for a 20 MPG standard-engine full-size car would reduce fuel use by 200 gallons. The driver who trades in a 20 MPG full-size car for a 25 MPG midsize would reduce fuel use by 120 gallons. The driver who trades in a 25 MPG midsize for a 30 MPG compact would cut fuel use by 80 gallons. The driver who trades in a 30 MPG compact for a 35 MPH current-technology hybrid would save 60 gallons. And the driver who trades in a 35 MPG current-technology hybrid for a 40 MPG advanced plug-in hybrid would save 40 gallons. By far the best oil-reduction bang for the buck lies in people giving up large SUVs, pickup trucks used for commuting, plus any type of overpowered vehicle, in favor of driving regular cars. The math is presented in detail in this paper by Richard Larrick and Jack Soll of Duke University. This suggests that instead of tax policy being focused on credits for buyers of high-mileage hybrids, and federal subsidies being focused on the development of high-mileage hypothesized future designs, tax policy should reward those who junk SUVs in order to buy regular cars. Tax programs to encourage drivers to junk old high-polluting automobiles were successful, so a junk-your-SUV program might work, too. Networks -- Switch to the Hot Games! Fox did not switch away from the 38-3 Philadelphia blowout of St. Louis, staying with every sleep-inducing snap, despite having the rights to the exciting New Orleans-City of Tampa contest; viewers saw the final plays of that game only after Rams-Eagles concluded. Then Fox stayed with the Dallas walkover against Cleveland, though Carolina at San Diego, to which the network had the rights, featured Sunday's best fourth quarter. Only 461 more shopping days till Christmas 2009! Christmas Creep Watch: Jon Warner of Franklin, Ind., writes, "On August 31st, my wife and I stopped at the Corydon, Indiana, Cracker Barrel for dinner. We walk through the front door, into the gift shop area that you must endure to reach the actual restaurant, and what do we see? A Christmas display." Ben Johnson of Fresno, Calif., who works at a Target store, reports, "This year we set Christmas lights and decorations on the last Thursday of August. Then on Friday, we set our Halloween candy aisles. This was per company policy." Kris Hitchcock of Kalamazoo, Mich., reports, "I was recently driving from Tennessee to Kalamazoo. Stopping for gas in Indiana, I was taken aback by the advertisement on the gas pump. 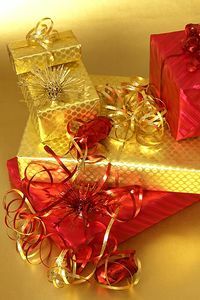 It displayed a gift wrapped with a bow, the colors red and green, with the headline 'Shopping for that last-minute gift? Consider a gas card!' This was on the August 31st." Kris, the question is, was the gas station jumping the gun on Christmas 2008 -- or on Christmas 2009? Why Tactics Matter: Trailing 17-7 on the road at Buffalo, Seattle faced a third-and-10 on its 25 with 45 seconds remaining in the first half. The Blue Man Group had only one timeout remaining, meaning its odds of reaching scoring position before intermission were not good. Seattle was moving into a mild Lake Erie wind, and Buffalo still had two timeouts. The situation dictated a run to keep the clock ticking, and then regroup in the locker room. Instead Seattle's coaches called for a pass, which clanged to the ground, incomplete. The Hawks punted just 22 yards into the wind; Buffalo launched a field goal with five seconds remaining to make the halftime score 20-7. Despite professionalism by the cheerleaders, the Dolphins were still the Dolphins. Worst Crowd Response: The Flaming Thumbtacks' home faithful repeatedly booed Vince Young. True, he played poorly Sunday, and the larger complaint is that he has not become a sophisticated quarterback. But whom did the Tennessee crowd think the Titans were drafting? Young was not a sophisticated quarterback in college, either. He got Texas a national championship, and got Tennessee into the playoffs last season. The same coaching staff that wants him on the field led Tennessee to a victory on opening day. What, precisely, is accomplished by booing your own quarterback? Brett Favre Gush Watch: Many over-the-top things were said about Favre over the weekend. The winner, from Phil Simms of CBS: "The Jets needed to get him [Favre] off to a good start, and that was a great, great way to do it." Favre had just thrown a 5-yard completion. 'Tis Better to Have Rushed and Lost Than Never to Have Rushed at All: Trailing the Green Bay Packers -- sorry, the Jets -- 20-7 early in the fourth quarter, the Dolphins reached third-and-goal on the Jets' 2. Run, run and a touchdown is likely. Instead Miami came out pass-wacky in a shotgun spread -- incompletion, incompletion and Favre's debut with New Jersey was a success. At the San Fran-Arizona game, an undrafted Cal-Davis quarterback battled an undrafted Northern Iowa quarterback, while two first-round-choice football-factory quarterbacks held clipboards. Bully for the Small Schools No. 1: On opening day, Arizona, Baltimore, Dallas, Detroit, Minnesota and San Francisco started Division I-AA, Division II or NAIA quarterbacks. That means of NFL starting quarterbacks, one in five did not play in Division I-A. Bully for the Small Schools No. 2: Reader Scott Abercrombie of Sydney, Australia, notes 26 of the 30 below-Division-I-A players taken in the 2008 draft made NFL rosters last week, including five draftees from Division II or Division III. Bully for the Small Schools No. 3: The key block on Roscoe Parrish's punt return touchdown for Buffalo was thrown by Jon Corto, an undrafted free agent from Division I-AA Sacred Heart University. Scouts Notes: Houston's Matt Schaub throws pretty well to his left -- but man does he telegraph passes when he throws right. The Steelers have obviously noticed this -- how long until every team does? Revenge of the Cupcakes: Ball State over Navy, Middle Tennessee over Maryland, Bowling Green over Pittsburgh, Michigan barely beating Miami of Ohio, Arkansas barely beating Division I-AA Western Illinois -- big-money schools that thought they were scheduling cupcakes for automatic wins are finding out differently. Obviously the major news is East Carolina over Virginia Tech and then West Virginia in consecutive weeks. That's the biggest opening for any college team, and the perennial-doormat Pirates find themselves ranked 14th in The Associated Press poll. As they say on the ECU campus, Everybody loves Leens! 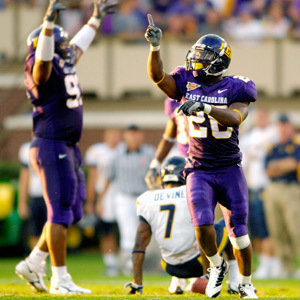 Contracts for East Carolina's Virginia Tech and West Virginia dates were signed several years ago, when ECU was on a 3-20 streak; football factory schools were eager to book the Pirates for what was assumed to be auto-wins. Now touts are looking at the East Carolina schedule and wondering if this team can crash the BCS party. Virginia Tech, West Virginia athletic directors complain: Next time we're putting it in the contract that they have to lose. Next Government Press Release: "Deficit Spending Good for Your Children": Perhaps Washington had no choice but to take over Fannie Mae and Freddie Mac, considering what we now know about years of self-serving lying by the management of both institutions. But taxpayers have been put on the hook for at least $200 billion in loan guarantees. Buried in the conservatorship declaration is word Congress may add extra subsidies to Fannie and Freddie to keep mortgage interest rates low. Washington has been involved in many loan guarantees, but never in mortgage rates. This all-new subsidy will make mortgage markets political on a permanent basis -- any time rates rise, borrowers seeking mortgages will demand taxpayers subsidize them. By shifting to taxpayers (and to our children, via still more deficit spending) some of the cost of borrowing, this may only further distort the mortgage market, encouraging buyers and brokers to generate imprudent loans and then passing costs along to taxpayers. [share]holders deserve to lose everything." Who said this, some left-wing fanatic? The editorial page of the Wall Street Journal. 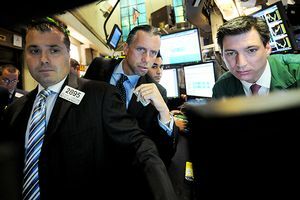 Stock prices rise on news that corporate dividends will now be billed directly to taxpayers. Anyway, get a load of the headline on the Treasury Department announcement of the takeover: TREASURY AND FEDERAL HOUSING FINANCE AGENCY ACT TO PROTECT FINANCIAL MARKETS AND TAXPAYERS. We're reaching into your pockets for hundreds of billions of dollars -- to protect you! TMQ Flashback: Here verbatim is an item from the April 25, 2005, Tuesday Morning Quarterback, which ran on NFL.com, published three days after the 2005 NFL draft: "It was bad enough when the Patriots used a sixth-round pick on quarterback Tom Brady, who'd had a fairly ordinary college career, then turned Brady into a Super Bowl MVP. Now they've used a seventh-round pick on quarterback Matt Cassel, who didn't even start in college. Please tell me New England will convert him into a tight end or maybe a defensive tackle. Please don't tell me he's another future Super Bowl MVP quarterback." Obscure College Score of the Week: Northern Arizona 68, New Mexico Highlands 10. Located in the mountains in Flagstaff, Northern Arizona promises students, "Almost as soon as you get here, you will have bigger ideas." Leading 45-3 in the fourth quarter, Northern Arizona was still passing -- apparently those bigger ideas you get don't have anything to do with sportsmanship. Even Division I-AA teams such as Northern Arizona now seek out cupcake opponents; the loser of the contest is Division II. Located in Las Vegas, N.M., New Mexico Highlands University is currently hosting an event called Two Weeks of Pleasure, which I am sorry to be missing. "Campus wide," the announcement says. Reader Animadversion: Got a complaint or a deeply held grievance? Write me at TMQ_ESPN@yahoo.com. Include your real name and the name of your hometown, and I may quote you by name unless you instruct me otherwise. Giving your hometown improves your odds of being quoted. Next Week: The Miami Dolphins try to get East Carolina University off their schedule. In addition to writing Tuesday Morning Quarterback, Gregg Easterbrook is the author of "The Progress Paradox: How Life Gets Better While People Feel Worse" and other books. He also is a contributing editor for The New Republic, The Atlantic Monthly and The Washington Monthly.